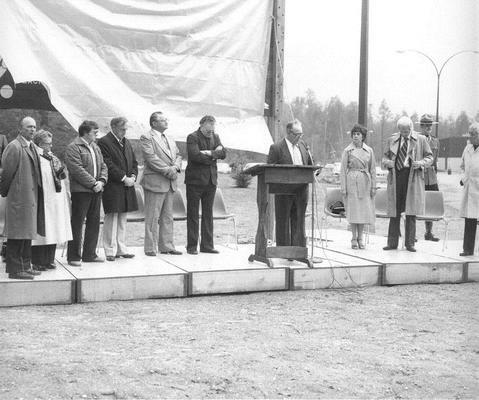 Dedication of Brennan Park on May 6, 1979. Left to right: Constable C. Perrault, Alderman W.V. Manson, Alderwoman Rose Tatlow, Alderman Bill Street, Alderman N.R. Barr, Chief Simon Baker, Father Shiel, Acting Mayor Nick Candy, Mrs Tess Brennan, Honourable Allan Williams (Labour Minister), Honourable Boland, Father Griffin. Brennan Park was named after Pat Brennan on May 6, 1979. Pat Brennan was the Mayor of Squamish for many years and was involved in the logging industry. The park covers 300 acres which includes ball and soccer fields, a lacrosse box, a picnic area, and a Civic Centre. Squamish Public Library, Squamish Files: Place Names.